It is said that Herbert F. Johnson loved the Johnson Wax World Headquarters building so much, he told Wright to design a cot so he could live there. Wright told him he needed a spectacular house, and Wingspread was the result. It takes its name from four wings that extend to compass points from a great room that served as a family gathering place and dining room. From the air, the house resembles a giant pinwheel. Situated in a 30 acre prairie, the house is the typical Wright design of bringing nature inside and it fits well into the gently rolling landscape. The great room is built around a 30 foot tall chimney with five fireplaces on three levels. The four wings contain the master bedroom, one is children's bedrooms, one was guest rooms and car ports, and the last wing was kitchen and servants' quarters. The roof surrounding the chimney resemble an upside down boat,filled with small skylights. Also trademark Wright are windows that extend from grade to ceiling, filling the room with natural light. 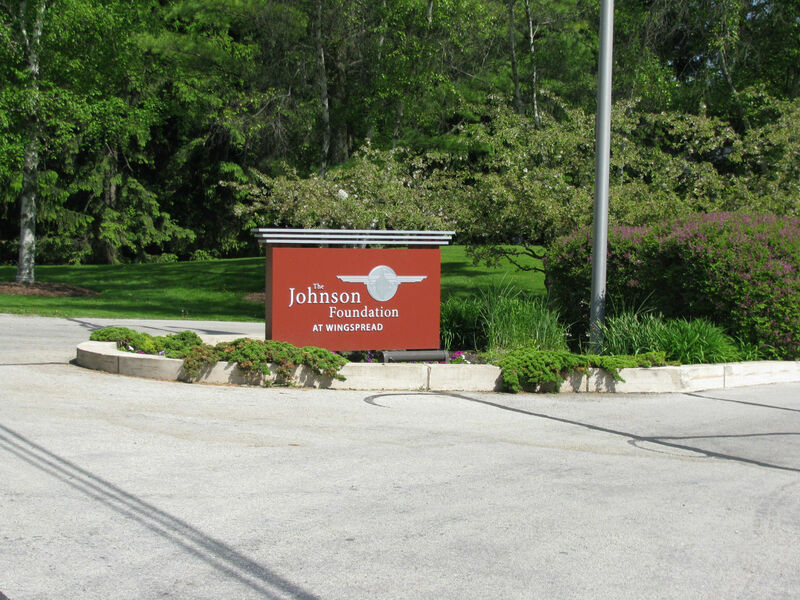 The Johnson family lived in the house only 20 years, and in 1959, it was signed over to the Johnson Foundation that continues to operate the house as part of the Wingspread conference center. It is open to the public for tours at no charge, but reservations are required. A link to the tours website is shown below. It is possible to tour both Wingspread and the S.C. Johnson and Son Administration Building and Research Tower in one day, if you properly plan your day. A tour of Wingspread takes about 90 minutes.